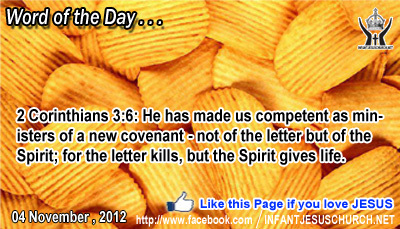 2 Corinthians 3:6: He has made us competent as ministers of a new covenant - not of the letter but of the Spirit; for the letter kills, but the Spirit gives life. Heavenly Father, thank you for your grace that has saved us since sin and has redeemed us from the law of sin and death. Thank you for giving the gift of your Son and the gift of your Spirit so that we can live with you in a promise of life, grace, and love. While we admit our weaknesses, we also assign to you that we will live to honor your sacrifice, love and covenant, trusting that you will eventually empower us to be what you are calling us all to be. In Infant Jesus' name we pray. Amen. Faith in God and “hope in his promises” make stronger us in the love of God. They are necessary for a good relationship with God, for being united with him. The more we distinguish God the more we love him and the more we love him the better we believe and hope in his promises. The Lord, through the gift of the Holy Spirit, gives us a new sovereignty to love as he loves. Do we allow anything to keep you from the love of God and the joy of helping others with a kind heart? Heavenly Father I love you, I desire to love you more and more. Gift to me that I may love you as much as I desire, and as much as I should. Loving Jesus, who has so loved and saved , the thought of whom is so sweet and always growing, come with Jesus and dwell in my hearts; that you keep a watch over my lip, my step, my deed, and I shall need not to be anxious either for my soul or my body. Give me love, sweetest of all gifts, which knows no enemy. Give me in our hearts pure love, born of your love to me, that I may love others as you love me.